Pneumoperitoneum is established with a 120 mm Endopath®d pneumoneedle through a left lateral umbilical incision. The Carbob dioxide2 insufflator is set to a maximal pressure of 15mmHg. After adequate pneumoperitoneum is established, a 10/12 mm Endopath bladeless trocar is placed and the camera with the 30 degrees upward-looking lens is introduced. To optimize visualization, the lens should be warmed with hot water prior to insertion. Next, the right-sided 8 mm robotic port is typically placed approximately 1 to 2 cm below the umbilicus and equidistant from the anterior superior iliac spine and the midpoint of the inguinal ligament. A second 10/12 mm Endopath bladeless trocar is placed at least two finger breadths above the iliac crest and as far lateral as possible. Next, the left-sided 8 mm robotic port is placed in a symmetric position to the right. The left-sided 5 mm Endopath bladeless trocar is placed at least two finger breadths above the iliac crest and as far lateral as possible. The right-sided 5 mm assistant port is placed midway between the 12 mm camera port and the 8 mm robotic port and slightly inferior to allow the assistant's instruments to reach the pelvis. A total of six ports are placed—a 10/12 mm camera port, 2 to 8 mm robotic ports, a 10/12 mm assistant port and 2 to 5 mm assistant ports (Fig. 2). After port placement, the robot is docked. Port placement can vary depending upon patient habitus and pelvic anatomy. The camera port may be placed infraumbilical or supraumbilical if the patient is greater than or less than 68 inches tall, respectively. If the patient has a narrow pelvis, the robotic ports can be placed more medially to minimize interference with the bony pelvis. Also, bIntuitive Surgical, Sunnyvale, CA. cACMI Corp., Southborough, MA. dEthicon, Cincinnati, OH. 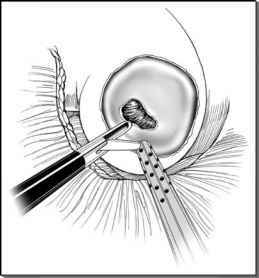 if adhesions are present, the order of port placement may be varied to allow for laparo-scopic release of adhesions.